We live in a world where we resent fear, judge it mindlessly and where we are bombarded with messages to live fearlessly. Yet we are wired with fear to alarm us of potential danger. However, living stuck in a life which is not on our terms is not a solution either. So how do we approach fear? Let’s first try to understand it. An example from my own life would be to meditate on what brings me suffering. 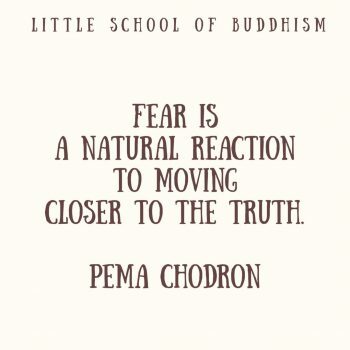 Fear is usually always somewhere in that picture, but one must be honest with him/herself in that meditation to accept fear as part of the experience. The next thing I do is to invite that fear for a cup of tea. Let’s work together on this, I say. What happens then is that the fear starts to change its face and becomes like a kind friend giving me some creative ideas. Fear is the strongest when I’m getting closer to my authenticity. And being authentic means being true to who we are, it takes all of our courage to be who we are meant to be even at the cost of being disliked, judged or misunderstood (all very hurtful but living unauthentically is more hurtful in the long run!). Then my fear and I go hand in hand towards our goal. What we gain with this approach is support from that same fear we tried to run away from towards exactly that for which we need courage. Can you see how that works? Have you ever tried this approach? To share contact us directly. We teach and inspire so many people around the world on the topic of happiness.